Derailleur hanger Felt bicycles shop on line. Felt 024 2011 derailleur hanger 6061 T651, made with CNC technology. Black anodized. Lighter and more durable than the hanger series. Felt 235 Team 2009 derailleur hanger 6061 T651, made with CNC technology. Black anodized. Lighter and more durable than the hanger series. Felt Alloy Hard tails 2000 derailleur hanger 6061 T651, made with CNC technology. Black anodized. Lighter and more durable than the hanger series. 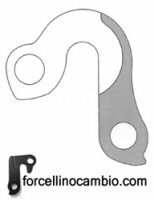 Felt AR 2/5 2015 derailleur hanger 6061 T651, made with CNC technology. Black anodized. Lighter and more durable than the hanger series. Felt AR FRD 2015 derailleur hanger 6061 T651, made with CNC technology. Black anodized. Lighter and more durable than the hanger series. Derailleur hanger Felt AR4 road 2011 Aluminium 5086 CNC machining Made in Italy. Chipotle Garmin 2009 derailleur hanger 6061 T651, made with CNC technology. Black anodized. Lighter and more durable than the hanger series. Felt Cross 2004 derailleur hanger 6061 T651, made with CNC technology. Black anodized. Lighter and more durable than the hanger series. Felt F1 PR 2015 derailleur hanger 6061 T651, made with CNC technology. Black anodized. Lighter and more durable than the hanger series.